dovetailing a rts and activism. We believe in challenging the gatekeepers of knowledge and platforming unheard voices through the arts. We aim to create original theatre that is provocative and innovative in order to start conversations and generate new ways of thinking. We deliver theatre and creative writing workshops working mainly with (but not limited to) People of the Global Majority (Black, Asian, Minority, Ethnic communities/People of Colour). 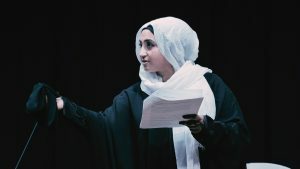 We are inspired by theatre/arts that connect with the heart rather than the intellect, art that awakens the sleepers and we are passionate about creating high quality theatre that changes the landscape of mainstream arts. Our work is driven by anti-racism and challenging the inherently white spaces in the arts.